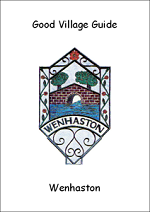 Wenhaston's Good Village Guide is filled with information about this Suffolk village of 800+ people. Click the image on the left to discover the Guide's origins, a little Wenhaston history, recycling, education, religion, medical services, info about village groups and organisations and who to contact if you wish to know more. The Guide is managed by Blythweb's staff and is regularly updated. Although not all details of village life are included the Guide nevertheless gives a flavour of this community. Enjoy our village! The Wenhaston Doom is a medieval wall painting that is unusual for having been painted on to wooden boards. Few other such Dooms have survived and indeed the story of the Wenhaston Doom is remarkable. On our website you can explore the Doom in detail and read a commentary about it and the various images featured. If you plan to come and see the Doom for yourself there is bed and breakfast and self catering accommodation in Wenhaston and area. See the Where to Stay section of the Menu on the left. We also have lots of information about accommodation in the surrounding area too. Members of the Wenhaston WI, their friends and families, have examined and recorded all the memorials in St. Peter's Churchyard in Wenhaston. Many of these were very worn or hidden in bushes, and so very hard to read. This project is now complete and Blythweb are pleased to show the results online as a searchable database (useful for those carrying out family research). May is a wonderful time in Suffolk and the morning serenade from the birds especially so! You can download a six minute MP3 of the Dawn Chorus recorded in the middle of Wenhaston at 4:30am on 6th May 2008. Dawn Chorus (1mb).